In person along the parade route downtown starting at 7:00 a.m.
On campus along 5th street. Leading elements of the parade ought to arrive on campus between 7:30 a.m. and 7:45 a.m.
On KCEN Channel 6 in Central Texas starting at 7:30 a.m.
Watch the Live stream right here starting at 7:30 a.m.
One might have expected the Baylor Homecoming Parade, which is believed to be the largest in the nation, to have had a modest beginning during its inception in 1909. But such was not the case. From the beginning, the Baylor Homecoming Parade was a first-class extravaganza of color that featured bands, horse-drawn carriages and wagons, student and civic organizations, and a stream of dignitaries. On Wednesday afternoon, Nov. 24, 1909, the Baylor Band, as is still the custom today, headed the first Baylor Homecoming Parade and was led by its towering drum major, who, it was reported, was " six feet six in his stocking feet and without his bearskin cap." As the band moved westward up Washington Avenue and then down to Eighth and Austin, it was followed in the parade--30 to 40 blocks long--by distinguished guests, speakers, alumni and former students, Baylor clubs, university trustees, Baylor President Samuel Palmer Brooks and faculty, the dean and faculty of the medical school, the R.C.B. 's and Calliopeans women's clubs, Alessandro's Band, the Erisophians and Philomathesians men's clubs, the Baylor Medicos, the football squad, the tennis club, and the basketball team, in that order. Autos and carriages, 60 in all, followed, and all were decorated--one completely covered with yellow chrysanthemums. The female literary societies filled "tallyhos" decorated with the colors of their organizations. The men's societies walked in four lines that greatly lengthened as the parade progressed when alumni of the groups joined in the march. Despite the initial success of the first Baylor Homecoming Parade, the event--indeed, Homecoming itself--did not become an annual tradition until after World War II. The second Baylor Homecoming Parade took place in 1915, six years after the first, and the third was not until 1924. Afterward, Homecoming was held intermittently until World War II and, after the war, resumed on an annual basis from 1945 to the present. Torchlight parades, the night before the Homecoming football game, were common in the 1920s. Floats first appeared in the parade in 1915. One float that year depicted a young freshman entering a main hall and, after a certain amount of grinding, emerging as a dignified senior. 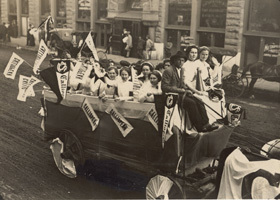 Floats became standard for the parade during the 1920s and usually carried general themes, often patriotic in nature. It wasn't until the 1950s that the floats began to take note of Baylor's opponent for the Homecoming football game. By 1960, practically every float carried a slogan that forecast doom for the mascot of the opposing team. 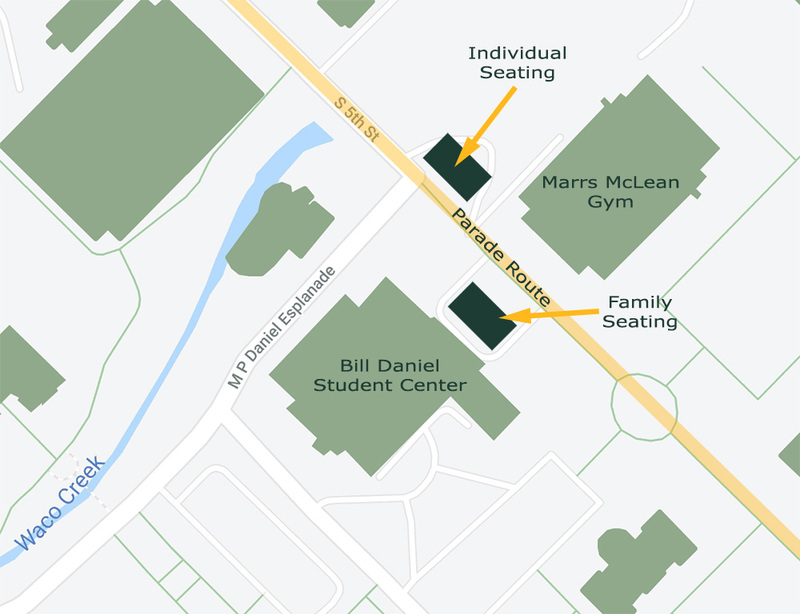 Watch the Baylor Homecoming Parade in style and enjoy breakfast in the grandstands! Click here to purchase tickets. Questions about this year's Homecoming Parade? Contact Lydia Strand (Lydia_Strand@baylor.edu) with any questions.